Version number: 3.03, released 5 September 2018. (4) a refined check is performed to see if a grid point lies within the data coverage of each bin. We now use a rectangular area rotated by the angle of the minimum-variance 1-D polynomial, with 100 km height, as wide as the 1-D polynomial. This new scheme results in the exclusion of a smaller number of estimates, and is more compatible with the assumption that the mean flow varies solely as a function of the distance across the time-mean velocity isolines in the bin. On this page, you will find a climatology of near-surface currents and temperatures for the world, at monthly and one-quarter degree resolution, derived from satellite-tracked surface drifting buoy observations. Animations of these currents are available Here. Maps of these currents in various regions can be seen on the Ocean Surface Currents web site. Laurindo, L., A. Mariano, and R. Lumpkin, 2017: An improved near-surface velocity climatology for the global ocean from drifter observations Deep-Sea Res. I, 124, pp.73-92, doi:10.1016/j.dsr.2017.04.009 . Lon (1x1440): longitude (degrees), negative=West. Lat (1x632): latitude (degrees), negative=South. U (632x1440): eastward speed (m/s) vs. Lat/Lon. V (632x1440): northward speed (m/s). SST (632x1440): bulk sea surface temperature (degC). eU, eV, eSST (632x1440): standard errors for U, V (m/s), and SST (degC). N (632x1440): number of drifter-days per square degree. The columns of the ASCII dataset are: Lat, Lon, U, V, SST, eU, eV, eSST, N.
The second version (Matlab binary format / ASCII / NetCDF) contains monthly mean values of surface currents and SST. The variable names of the Matlab file are the same as above. The third index of matrix U, V, etc. corresponds to the month: 1=January, 2=February, etc. In the ASCII dataset, the first column is the month; the rest of the columns are the same as in the annual climatology file described above. Lat (1x317): latitude (degrees), 73S to 85N. Up2bar (317x720): Zonal Velocity Variance, mean(u' ^2) (m^2/s^2). Vp2bar (317x720): Meridional Velocity Variance, mean(v' ^2) (m^2/s^2). rA (317x720): Variance ellipse semimajor axis (m^2/s^2). rB (317x720): Variance ellipse semiminor axis (m^2/s^2). angle (317x720): Orientation angle of variance ellipse (degrees, 0=east/west). N (317x720): Number of drifter-days per square degree. Note that Up2bar+Vp2bar=rA+rB, which is twice the eddy kinetic energy. Description: Satellite-tracked SVP drifting buoys (Sybrandy and Niiler, 1991; Niiler, 2001) provide observations of near-surface circulation at unprecedented resolution. 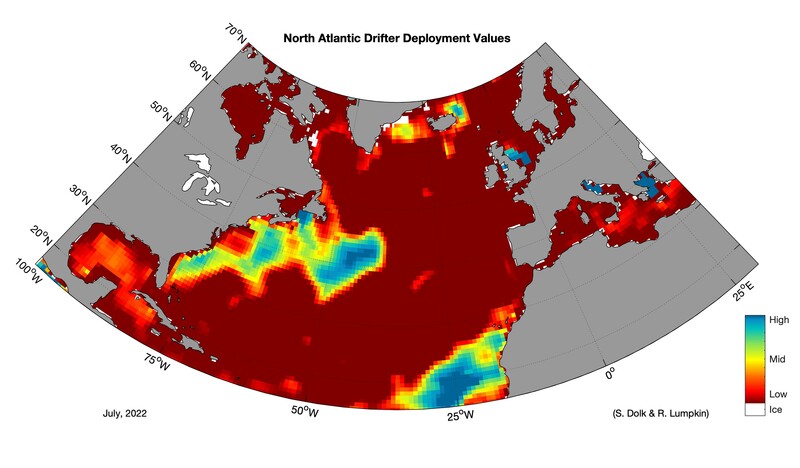 In September 2005, the Global Drifter Array became the first fully realized component of the Global Ocean Observing System when it reached an array size of 1250 drifters. A drifter is composed of a surface float which includes a transmitter to relay data, a thermometer that reads temperature a few centimeters below the air/sea interface, and a submergence sensor used to detect when/if the drogue is lost. The surface float is tethered to a holey sock drogue, centered at 15 m depth. The drifter follows the flow integrated over the drogue depth, although some slip with respect to this motion is associated with direct wind forcing (Niiler and Paduan, 1995). This slip is greatly enhanced in drifters that have lost their drogues (Pazan and Niiler, 2000). Drifter velocities are derived from finite differences of their position fixes. 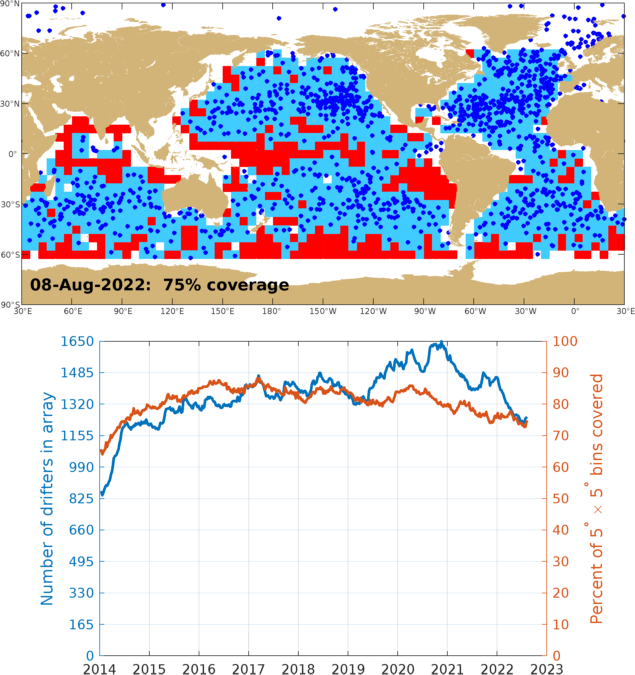 These velocities, and the concurrent SST measurements, are archived at AOML's Drifting Buoy Data Assembly Center, where the data are quality controlled and interpolated to 1/4-day intervals (Hansen and Herman, 1989; Hansen and Poulain, 1996). In this study, 6h winds were interpolated onto the drifter positions and used to estimate and remove the slip (Niiler and Paduan, 1995; Pazan and Niiler, 2000; Laurindo et al., 2017). All velocities and SSTs were lowpassed at 1.5 times the local inertial period, or five days if that is smaller, to remove high frequency variability (diurnal, tidal, inertial). If 1.5 times the local inertial period is shorter than one day, the lowpass is done at one day. 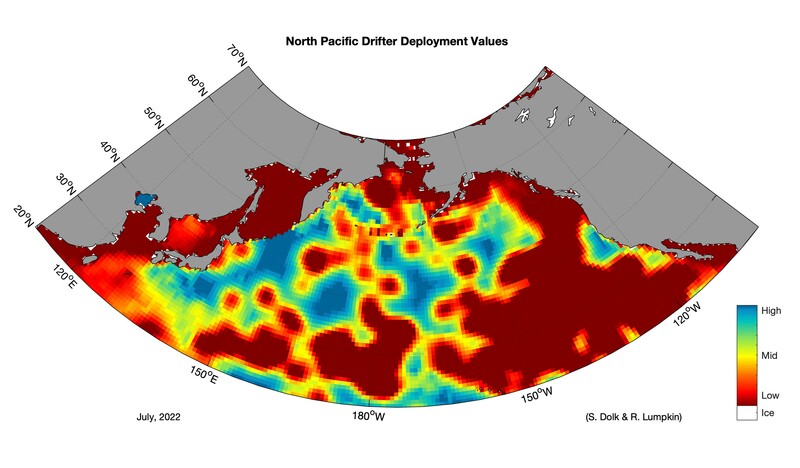 Drifters sample regions of the ocean inhomogeneously, which can cause aliased time-mean values if strong seasonal or interannual variations are neglected. To address the seasonal cycle, Lumpkin (2003) developed a methodology to simultaneously decompose the drifter observations into time-mean, seasonal and eddy components using a Gauss-Markov approach that produces formal error bars on all components. Lumpkin showed that this methodology produces significantly different results than standard bin averaging. 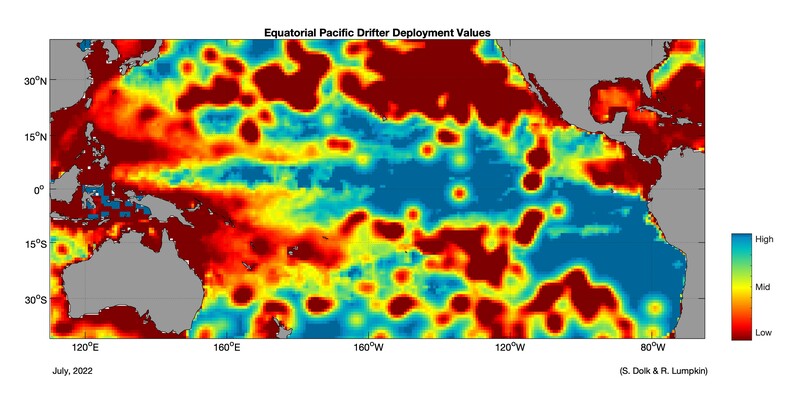 This methodology was further developed and evaluated using SST observations and products, and simulated drifters in the MICOM model (Lumpkin and Garraffo, 2005). The method produces significantly improved estimates of the mean currents and SST, and simultaneously provides the annual and semiannual amplitudes and phases at a nominal resolution of one degree squared. To address inhomogeneous interannual sampling associated with ENSO, Johnson (2001) added a component proportional to a five-month lowpassed Southern Oscillation Index, and estimated components in elliptical bins with axes scaled and oriented using the residual variability (i.e., the eddy fluctuations). In Lumpkin and Johnson (2013), the methodologies of Lumpkin (2003) and Johnson (2001) are combined. The observations are projected onto a time mean, annual and semiannual, SOI, and spatial gradient components within elliptical bins scaled and oriented using eddy fluctuations, and error bars are estimated for all terms. In Laurindo et al. (2017), slip correction using a spatially-varying coefficient was introduced in order to exploit velocity information from undrogued drifters. This approximately doubles the number of available observations, which allowed the bin sizes to be considerably reduced (one degree radius circles). In addition, 1D spatial fitting was done in the direction that maximizes the explained variance, allowing for greater resolution of cross-stream velocity gradient. These two changes result in significantly better spatial resolution of ocean current structure. In addition, Laurindo et al. examined how the formal standard errors compare to actual errors when using a "toy" dataset of surface currents derived from AVISO and subsampled at the drifter observation locations and times; they found that formals errors underestimate actual errors by approximately a factor of 2. When these more advanced methodologies are applied to the modern data set of tropical Atlantic drifter observations, many features of the near-surface circulation become apparent which were not resolved by older ship-drift-based climatologies or by SEQUAL/FOCAL drifter trajectories (Lumpkin and Garzoli, 2005). In the Hawaiian Island region, the thousand-kilometer long island wake is revealed at unprecedented detail (Lumpkin and Flament, 2013) Zonally elongated mid-ocean striations are resolved in the zonal currents of all major ocean basins (Laurindo et al., 2017). Credits: This climatology was developed by Rick Lumpkin (NOAA/AOML) and Lucas Laurindo (Univ. Miami), in collaboration with Arthur Mariano (Univ. Miami), Mayra Pazos (NOAA/AOML), and Erik Valdes (CIMAS/AOML). Previous versions were developed with Gregory Johnson (NOAA/PMEL), Silvia Garzoli (NOAA/AOML), Jessica Redman (CIMAS), and Zulema Garraffo (Univ. Miami). Cuny, J., P. B. Rhines, P. P. Niiler and S. Bacon, 2002:Labrador Sea boundary currents and the fate of the Irminger Sea Water. J.Phys. Oceanogr. 32, 627-647. 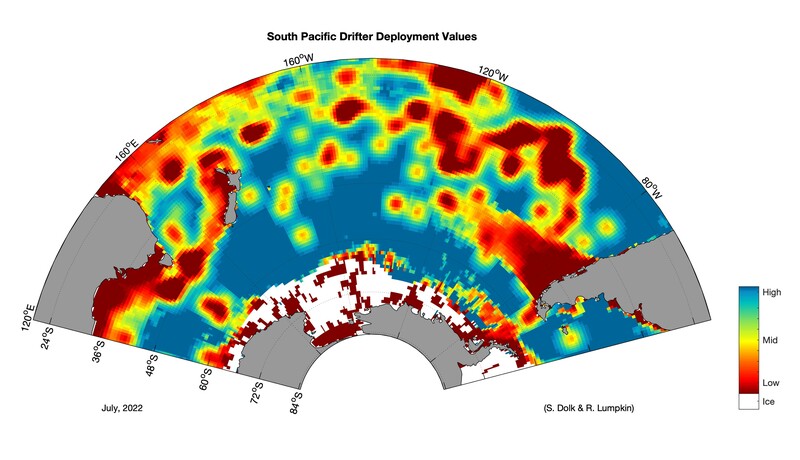 Hansen, D. and A. Herman, 1989: Temporal sampling requirements for surface drifting buoys in the tropical Pacific. J. Atmos. Oceanic Technol. Hansen, D. and P.-M. Poulain, 1996: Quality control and interpolations of WOCE-TOGA drifter data. J. Atmos. Oceanic Technol.13, 900-909. Johnson, G.C., 2001: The Pacific Ocean Subtropical Cell Surface Limb. Geophys. Res. Lett., 28, 1771-1774. Laurindo, L. C., A. Mariano, and R. Lumpkin, 2017: An improved near-surface velocity climatology for the global ocean from drifter observations. Deep-Sea Res. I, 124, 73-92. 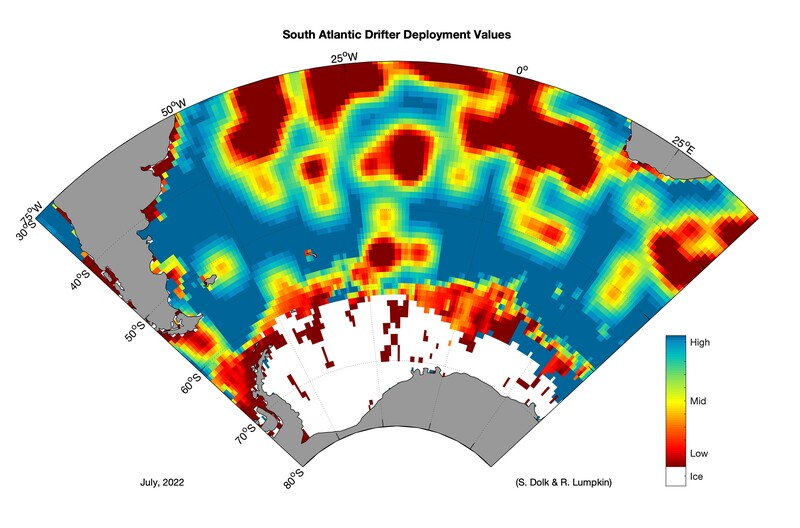 Lumpkin, R., 2003: Decomposition of surface drifter observations in the Atlantic Ocean. Geophys. Res. Lett. 30(14), 1753, 10.1029/2003GL017519. Lumpkin, R. and S. L. Garzoli, 2005: Near-surface Circulation in the Tropical Atlantic Ocean. Deep-Sea Res.I 52 (3), 495-518, 10.1016/j.dsr.2004.09.001. 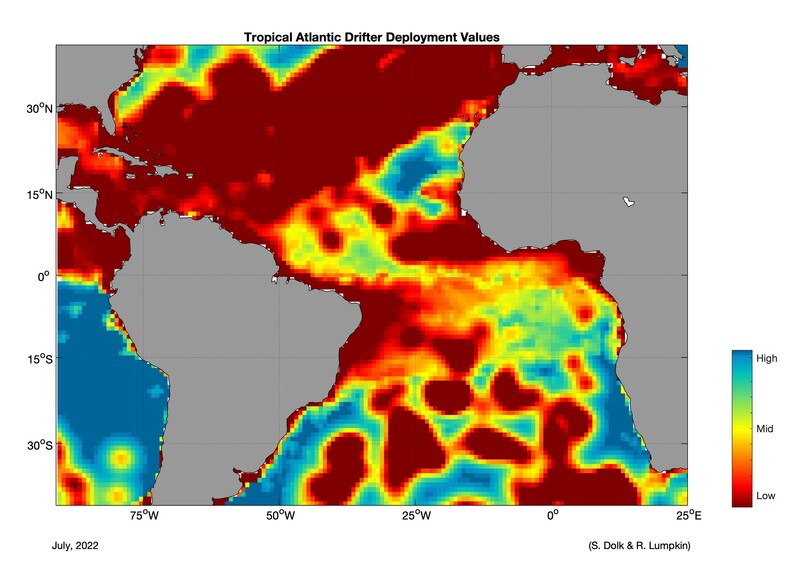 Lumpkin, R. and Z. Garraffo, 2005: Evaluating the Decomposition of Tropical Atlantic Drifter Observations. J. Atm. Oceanic Technol. 22, 1403-1415. Lumpkin, R. and G. C. Johnson, 2013: Global Ocean Surface Velocities from Drifters: Mean, Variance, ENSO Response, and Seasonal Cycle. J. Geophys. 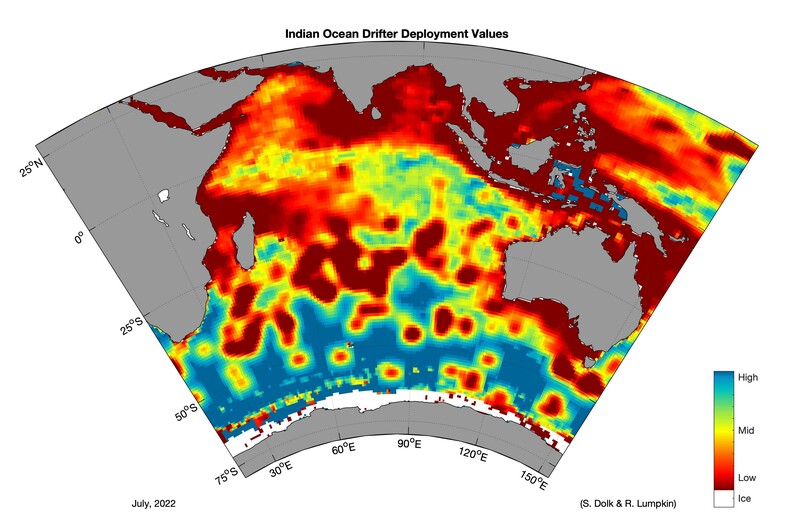 Res.-Oceans, 118, pp 2992-3006, doi:10.1002/jgrc.20210. Lumpkin, R. and P. Flament, 2013: On the extent and energetics of the Hawaiian Lee Countercurrent. Oceanography, 26(1), 58-65. Niiler, P. P., 2001: The world ocean surface circulation. In Ocean Circulation and Climate, G. Siedler, J. Church and J. Gould, eds., Academic Press, Volume 77 of International Geophysics Series, 193-204. Niiler, P. P., R. Davis and H. White, 1987: Water-following characteristics of a mixed-layer drifter. Deep-Sea Res. 34, 1867-1882. Niiler, P. P. and J. D. Paduan, 1995: Wind-driven motions in the northeast Pacific as measured by Lagrangian drifters. J. Phys. Oceanogr. 25, 2819-2830. Niiler, P. P., A. Sybrandy, K. Bi, P. Poulain and D. Bitterman, 1995: Measurements of the water-following capability of= holey-sock and TRISTAR drifters. Deep-Sea Res. 42, 1951-1964. Pazan, S. E. and P. P. Niiler, 2000: Recovery of near-surface velocity from undrogued drifters. J. Atmos. Oceanic Technol. 18, 476-489. Ralph, E. A. and P. P. Niiler, 1999: Wind-driven currents in the Tropical Pacific. J. Phys. Oceanogr. 29, 2121-2129. Sybrandy, A. L. and P. P. Niiler, 1991: WOCE/TOGA Lagrangiandrifter construction manual. WOCE Rep. 63, SOI Ref. 91/6, 58pp, Scripps Inst. of Oceanogr., La Jolla, Calif.